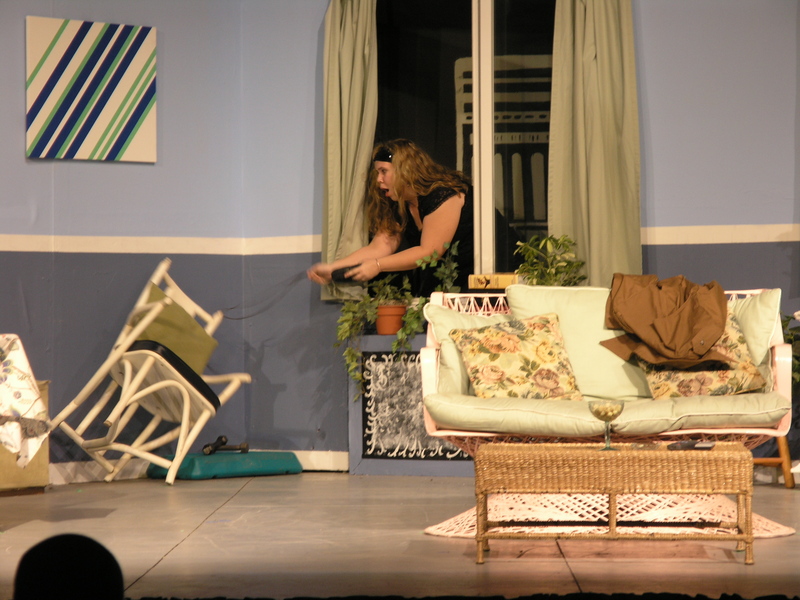 Posted on October 12, 2013 by J.
I was just going through photos of the first play I directed on St. Croix , a one-act play called “When Men Are Scarce” for Caribbean Community Theatre in 2006. I no longer remember the name of the playwright, but it was a play from the early 1960s — very Doris Day-ish. Certainly before the Sexual Revolution! While very dated, it was a well-constructed play. We did our best to overcome its age, and we turned it into very physical comedy. I told the cast that it was, in effect, an episode of “I Love Lucy”, with the brunette in the photo (wose name I’ve forgotten, sorry) playing Lucy, the blonde (Lisa Vaughan) playing Ethel, Mariah Mays playing Ricky, and Emily Van Buren playing Fred. Some of the physical action of the play was indicated in the script, although not in the quantity or detail that we ended up using. “Ricky” and “Fred” dressed the set up to look like a romantic dinner had happened. (We had a lot of props!) Some of it wasn’t in the script at all: “Lucy” trying various ways to build a “step” so she can come in through the fire escape window, or pushing the menswear under the loveseat with her foot while pretending the coats aren’t really there. And when you’re playing comedy, remember that virtually all comedy is physical. Even verbal jousting, like Noel Coward, is much funnier when you add the physical to it. Don’t let the punchlines do all the work. If you do, you are cheating both yourself and your audience. Check out the Facebook page for more photos from “When Men Are Scarce”! 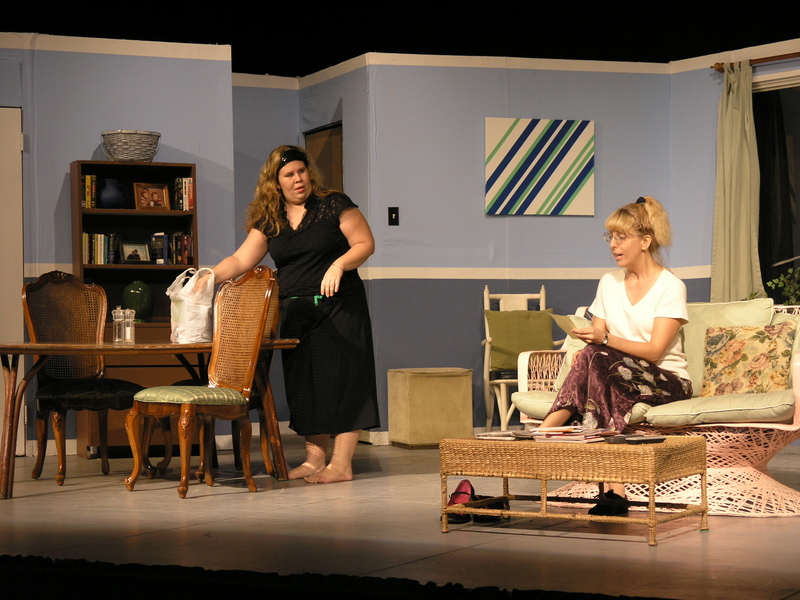 This entry was posted in Acting, Action and tagged Acting, acting technique, Actor, Blocking, Comedic Action, Community Theater, physical comedy, Stage business, Stage movement. Bookmark the permalink. ← Why you need to practice onstage physical movements. A lot.